We are very excited to announce that Copper Run Distillery’s, Overproof White Rum was awarded a Gold Medal and Best in Category awards during the American Distilling Institute’s “9th Annual Judging of Craft American Spirits” that took place in Louisville, Kentucky on the 31st of March 2015. 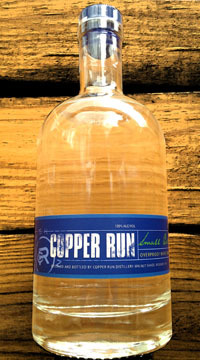 This was the first competition entry for Copper Run Distillery in the past 5 years so we very pleased that our hard work and commitment to producing high quality spirits is being recognized and appreciated but above all we’d like to thank all of you, our fans, for believing in what we do here at Copper Run and for supporting us all these years. We are especially proud of this award because clear spirits rarely receive Gold medals, so we’d like to thank the judges for bestowing this rare honor to Copper Run. Our Overproof White Rum is made from dark brown sugar and blackstrap molasses, doubled distilled, and bottled at 120 proof. This technique concentrates the flavor and aroma making it the perfect rum for your favorite spring or summer time cocktail. Fill a highball glass with ice. Combine ingredients in a shaker and shake. Strain into highball. Garnish withan orange wedge, a lime wedge, and a moonshine soaked cherry on a toothpick. Muddle lemonand orange wedges with sugar. Top with mango juice, rum, and ice. Toss mixturea few times between the glass and shaker to combine. Add a splash of grendadine for garnish. Muddle lime wedges and brown sugar in a rocks glass. Add ice to fill glass, top with rum, and toss a few times between another cup to mix. Muddle mint leaves, lime wedges, and sugar lightly in the bottom of a shaker cup. Add ice and rum, shake vigorously. Pour mixture into a highball glass, add additional ice if desired, and top with club soda. Stir to mix.